Economy parking has 4542 spaces available in the new, 7 level Ground Transportation Center (GTC). To access Economy Parking, just follow the Economy/Rental Car Pickup signs to your left when you come to airport and take the first left exit past the GTC. Another quick left takes you into the facility. Electric Vehicles - Level 5 offers 10 charging stations for electric vehicles, including two handicap-accessible spaces. Find these charging stations next to the elevators on level 5. Complimentary luggage carts are available next to the elevators on each level. Economy parkers can reach the terminal easily by using the Ground Transportation Center’s pedestrian walkway with moving sidewalks, beautiful landscaping and Memphis music playing from the speakers above. Take the elevators to level 1 to access the pedestrian walkway. The walkway takes you straight to Terminal B, where you will proceed two levels up for ticketing and security. Maximum parking duration allowed is 30 days. Contact the parking office at (901) 922-8130 if you need to park longer than 30 days. Long-Term Parking is a good value at $15/day and offers 2225 convenient parking spaces. To access Long Term Parking, just follow the Long Term signs to your left when you come to airport and take the first left exit past the GTC. The Long Term parking entrance is then straight ahead. Short-term parking has 487 spaces on the ground level of the three-story parking facility directly across from all three terminals. To access short term parking, stay in the left lane when approaching the airport and follow overhead signs to short-term parking. Oversize vehicle parking has 180 parking spaces for RV’s, tractor trailers, large vans, vehicles with trailers and large commercial vehicles. Contact the parking office at (901) 922-8065 with any questions or special requests. Maximum parking duration allowed is 30 days. Contact the parking office at (901) 922-8130 if you need to park longer than 30 days. Accessible spaces are available in all parking areas, near the elevators and walkways. Vehicles parked in accessible spaces must display an appropriately designated license plate or hang tag in their rearview mirror. Regular rates apply to accessible parking. For inquiries related to accessible parking, please call 901-922-8065. Maximum parking duration allowed is 30 days. Contact the parking office at (901) 922-8130 if you need to park longer than 30 days. Travelers who need more than 30 days of parking are asked to call the parking office at 901-922-8065. Without advanced notification about extended parking needs, your vehicle may be towed at your expense after 30 days. may pay with cash, debit or any major credit card. For your convenience we offer Credit Card Express, which allows for ticketless transactions. Simply insert your credit card at the entrance and use the same credit card when exiting. Lost your parking receipt? Need a copy? No problem — just call the parking office at 901-922-8065, Mondays through Fridays, 8 a.m. to 5 p.m. or send an email to [email protected]. If you are a MEMperks customer, parking receipts will be emailed to you at 12:30 a.m. CST the day after exiting the parking facility. If you need a duplicate receipt, log in to your MEMperks account and select “Resend Email Receipts” under the “Visits” tab. Introducing the MEMPERKS Frequent Parker Program. 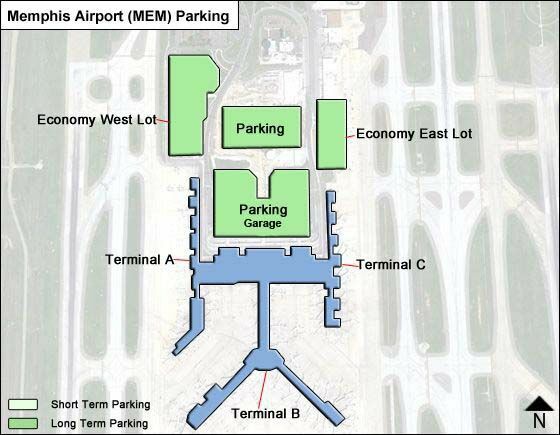 MEMperks is a rewards program that allows you to earn points when you park at the Memphis International Airport. The points can then be exchanged for free parking. Enrollment in MEMperks is free, and participants earn one point for every dollar spent on parking in any of the airport’s parking facilities: economy, short-term, long-term and oversized vehicle. MEM has a free waiting area less than a minute’s drive from the terminal. Safely and conveniently wait for the "I’m ready for pick up" call, and greet your passenger curbside on the pick-up driveway. The cell phone lot -- located to the right of the main drive just after you enter the airport grounds -- has been updated with flight information displays with arrival times, improved lighting and landscaping. Passengers may be dropped off at the Ticketing (upper) level or Baggage (ground) level of the terminal. Once on the airport grounds, just follow the signs to the terminal and take the right lanes to the upper level or stay in the center lanes for the ground level. Remember: Whether picking up or dropping off, try to be as efficient as possible. It’s not just for security purposes – it’s courteous to your fellow travelers. If your party has extra luggage, or you just want to spend extra time inside the terminal, please park in short-term parking – there are usually spaces near the terminal and the first 30 minutes are free. Need a jump? Can’t remember where you parked? MEM has you covered with free 24-hour customer assistance. Services offered include battery starts, tire inflation, lost car location and security escorts. Just call 901-922-8065. Please contact the I.D. Office at (901) 922-8005 or [email protected] for information on employee parking.